Put those in your .vimrc or run them as commands and watch as using the scroll wheel or two-finger trackpad scroll cycles through your history. Enjoy! Fun fact: the comic alludes to mapping caps lock to control, which is something that Emacs users actually do. Vim users are more partial to mapping caps lock to escape. Last week, I gave a presentation on learning LaTeX to interested UD students as an activity of our ACM Student Chapter. The presentation aimed to cover everything necessary to write a paper or lab report in LaTeX, while also touching on aspects useful for math homework. Fittingly, I created a slideshow using LaTeX (specifically, the Beamer package) to streamline my presentation. Here is that slideshow, in PDF form. For best results, view it in full-screen single-page mode, or “presentation mode,” if your PDF viewer supports it. A few months ago, I made a blog post called ‘How to be the guy in “git.txt,”’ referencing the mouseover text of a certain xkcd comic. Here I’d like to expand on that and provide more useful resources. First, read this tutorial. It discusses different workflows you might use with Git, building up from simpler to more complex workflows. It helps you to understand the idea behind what you’re learning before you really plunge into it. Next, I again recommend Pro Git, a free online book on how to use Git. You don’t have to commit to reading the whole thing, but just skimming the first 3 chapters can make you much more knowledgeable about Git. man git. I wouldn’t recommend using man pages to learn Git, but they are very useful as a reference. To view the manual page for a specific git command, for example, git merge, use git help merge. Lastly, I’ll leave you with a cheat sheet I found. I’ve started shying away from graphical Git clients like GitHub Desktop recently. While they’re great for beginners and make visualizing the repository history easy, I wouldn’t want to be dependent on them and be lost when working on a machine that doesn’t have them installed or a remote server via SSH. 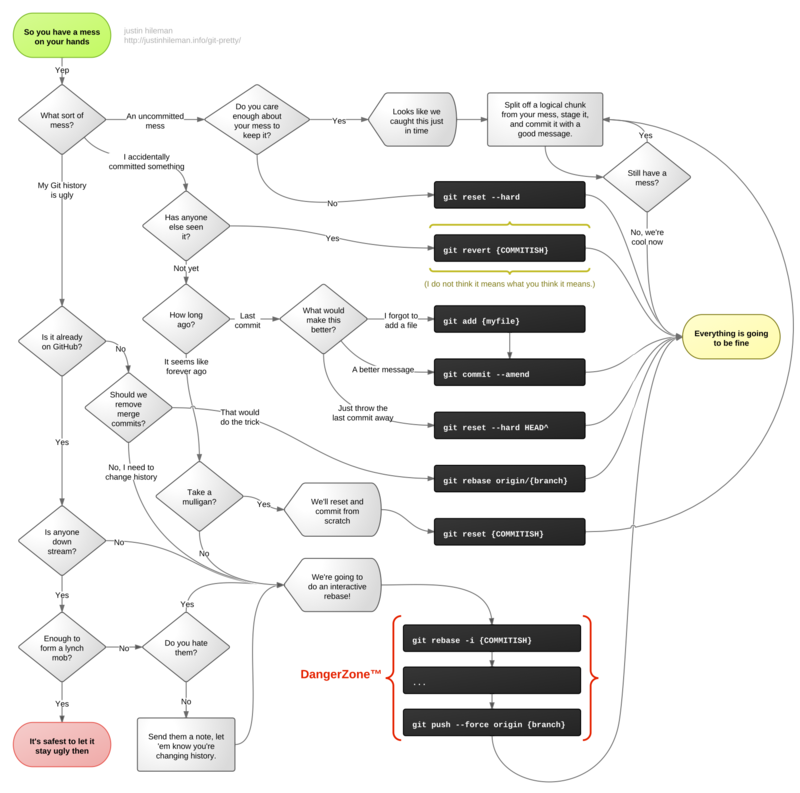 Of course, this flowchart doesn’t cover everything, and, unlike the guy whose phone number is in git.txt, it doesn’t really talk about branches. You’ll still be lost if you run into merge conflicts, for example. It does, however, cover a few common issues you might run into, like adding a file to your last commit or fixing a commit message (assuming you haven’t pushed/synced). To really master Git, check out the book here: https://git-scm.com/documentation. Also, remember to write better commit messages than these!